It’s 840 horsepower. There. That answers your first question about the 2018 Dodge Challenger SRT Demon. Now for the window dressing. Dodge summoned the Challenger SRT Demon from the depths of its engineering and design departments to Pier 94 in New York on Tuesday night, hours before the New York Auto Show’s press days were due to kick off. 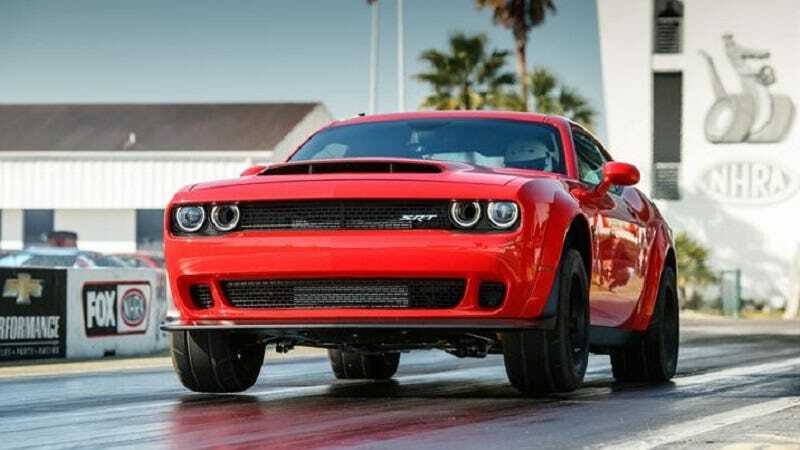 The Demon can hit 60 miles per hour in 2.3 seconds pulling 1.8 G’s, with a 9.65 quarter-mile drag time at 140 mph, and the 6.2-liter Hemi Demon V8 engine can pump out 770 lb-ft of torque with a higher rev limit of 6,500 rpm. The car, much like everyone on our staff, is hot and muscular on the outside, but is oh-so-cool underneath with the first ever liquid-to-air charge air cooler system, dropping intake temperature by 45 degrees, mounted on a production vehicle. In addition, it comes with updated rear-gearing to help torque, the largest functional cool-air intake system on a production car, a massive 2.7-liter supercharger offering 14.5 pounds of boost, and the system can switch between racing gas and traditional pump fuel. The presentation confirmed a few new things about the Demon that have been kept a secret for months, including that you can option to remove the passenger seat and back seat, and then buy them back for just $1 each. The front suspension is loosened to help shift weight to the rear quicker. The car can achieve full boost within six feet of launching off of the starting line by using traditional drag technology applied to a production car for the first time. The NHRA confirmed the drag time, and then banned the car from competition. Doesn’t mean you can’t still run it, though. Own a Hellcat? Trade it in. Your life is now pointless otherwise.